CRP Racing have just announced that they are going to be racing a pair of Nissan GT-R's in World Challenge for 2012. Brass Monkey Racing tried racing a couple of GT-R's in 2010, and 2011, but they never got too far with the cars. Brass Monkey had some issues with cooling, and the transmission. Now a few years along, hopefully CRP will be able to work out those issues. The car is going to be sponsored by Hawk brakes, and Cragar Wheels. Hawk already produces brake pads for the Nissan GT-R, but I haven't seen anything in Cragars lineup that will fit on a GT-R. Maybe soon. World Challenge GT is a tough series, with a number of well established teams, with very fast cars. Coming from the Corvette, a lightweight V8, rear wheel drive car, the GT-R will be a new experience for the team. HARRISBURG, NORTH CAROLINA, February 1, 2012 – Hot on the heels of asuccessful 2011 season for Hawk Performance® and Cragar Wheel®Corvettes, CRP Racing is announcing exciting changes for the 2012 Pirelli World Challenge GT series. A new partnership between CRP Racing and Nissan North America will see the debut of two Hawk Performance Nissan GT-Rs this season. Nicholas Short, owner of CRP Racing, agrees. “We’re very happy with this new collaboration between CRP Racing and Nissan North America to develop the Nissan GT-Rs into a race winning package. 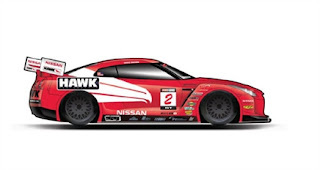 We now have two great partners in the Hawk Performance Group and Nissan, which will allow CRP Racing to show its true potential as a car builder and a race team.” The Nissan GT-Rs are currently being built at CRP’s Harrisburg, NC, race shop. Back for the 2012 season is Mike Skeen, who will pilot the #2 Hawk Performance Nissan GT-R. Skeen had an impressive debut in World Challenge, having already scored four wins in the series and finishing third in the Driver’s Championship in his first full season of competition. “I am excited to be back with CRP in World Challenge for 2012,” says Skeen. “Our performance with the Cragar Wheels Corvette was always strong, and hopefully gave the fans something to look forward to at each event. The move to the Hawk Performance Nissan GT-R is an exciting challenge, and I am looking forward to it and have no doubt that we will be successful.” A second driver for the CRP Team will be announced in the near future. CRP Racing plans to not only have a winning team, but one that is fan-oriented as well. Updates from the track, videos (including exciting in-car footage), and photos will be posted each race weekend at www.CompetitionRaceParts.com and the CRP Racing Facebook page. The team invites fans to stop by the transporter at all World Challenge races to meet the team and to check out the Hawk Performance Nissan GT-Rs up close. Sanctioned by SCCA Pro Racing and managed by WC Vision, the World Challenge Championship will offer four categories this year - GT, GTS, Touring Car and Touring Car Spec-B. The series will feature 12 races at eight different venues, beginning with the doubleheader weekend at the Honda Grand Prix of St. Petersburg March 23-25, 2012. It promises to be an exciting, fun-filled weekend for all race fans.